I left San Jose on Thursday the 25th of August and had a smooth flight on Southwest. My friend Terri picked me up at the airport and since I usually kid her about long hauling me via the tunnel this time she took my suggested route which ended up being longer due to all the road construction going on so I guess next time when Terri is driving we'll take the tunnel out of the airport and no more teasing from me! Terri who lives in Las Vegas was staying 2 nights at Mandalay Bay and I was staying at THEHotel at Mandalay Bay. Once at Mandalay Bay we split up to check in and I had the friendliest registration agent ever, he was incredibly good natured and in a wonderful mood, so for the first time I ended up in a V suite on the 36th floor. A V suite is not that much different then the normal suite at the THEHotel other then the living area is a lot wider and due to it being a corner suite you have views from 2 different angles. In addition to the view of the pools, I had a partial strip view out of the 2nd window in the bedroom, but I can't seem to locate a photo of that view. This suite ended up being very quiet which I loved due to being at the end of the hallway and the bed was much more comfortable then the one I ended up with later in the trip at Palazzo. While I was unpacking I had a call from Terri and MB had offered her a suite at THEHotel on the 35th floor so that worked out well for us. We had quite a few friends visiting Las Vegas this trip and I had a few of then sending me text messages during this time to tell me they had either landed or were just taking off and we were looking forward to seeing everyone soon. Terri and I met at THECafe after unpacking to have lunch. I was really looking forward to this as my favorite lunch dish years ago was their lobster cobb salad and before I left home I had found out it was back on the menu. Lunch at THECafe started out well with our server Hector recognizing me even though I hadn't been there for over a year. I was a bit dismayed though when the lobster cobb arrived as it used to be a medallions of lobster and was a various generous portion of lobster and now it was served in the shell and there wasn't much lobster after you detach it. Terri had a chicken caesar salad which she said was alright. Normally on past trips to THEHotel I would make a point of eating every breakfast/lunch at THECafe but this trip once was enough. It was fine, just not as good as in years past. It was time to get our gamble on and I was hoping for better luck then my last trip in July. After getting my $450.00 in free play on my Mlife card, I checked out the high limit room at MB and while I didn't spot my fave $1 DaVinci Diamonds they had Rembrandt Riches. Unfortunately Rembrandt held on to his riches and I lost $240.00 very quickly and then quickly left the high limit room. Outside the high limit room is two $5 Wheel of Fortune slots. I've done well occasionally on them, but as I'm putting in a hundred I notice they have switched the machines out and the symbols are a bit different. Fortunately I hit the above right away for $250.00 so things were looking up. I continue to play WOF and finally got a spin and won another $200.00 but was only $50 ahead due to how long it took to get the spin. Not far away from WOF was another favorite slot, the 5 cent Kitty Glitter. I got lucky and hit the bonus quickly and won a little over $300 on it. I tried it for a while longer but it had cooled down or I had, so I moved on to American Idol. For once American Idol decided to give me some action and I was doing quite well on it and up a couple hundred when I decided to cash out as it seemed to be cooling off. As I was cashing out and waiting for the timer to expire, it hit the community bonus, after that, I had 5 seconds counting down on the timer and it immediately went into a 2nd community bonus and I won another $62.50 on it. 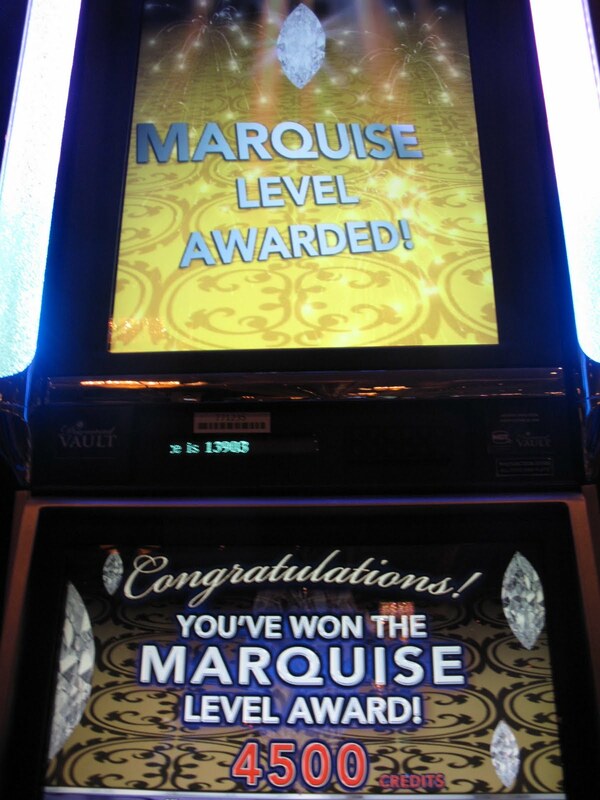 I decided to wander around the casino and do hit and runs on the slots, in other words, hit for a decent win and leave. I found a old favorite life of luxury slot, Rome to Riches and hit 3 wilds for $200.00 on it. The lady next to me was playing Alpine Adventure and hitting bonus after bonus on it but she was only betting one cent, so not making much, but she was having fun! After Rome to Riches I found a 5 cent Wolf Run and went on a run of luck for it for a while and ended up about a $1000.00 ahead, a nice start to this trip. Believing that I was on a lucky streak I made the mistake of visiting the Mandalay Bay high limit room again. It didn't end pretty and I was even when I left there. There's a slant top Hexbreaker 2 between House of Blues and one of the casino bars which Randy and I like but the last few trips we tried it we hadn't had any luck. For whatever reason I decided to play it and was rewarded with a couple good hits of $146.40 and then $105.60. It was almost time to meet Terri for dinner when I hit these lovely 2 rows of wilds and black cats for $651.20, so I was able to cash out and go to dinner briefly a winner! Dinner was at China Grill a favorite MB restaurant of mine and Terri and I were seated promptly in a booth and ordered their prix fix menu. I've covered this prix fix in previous trip reports so if you are curious about it and can't find it on the blog just let me know and I'll point you to it. As usual the dinner was delicious and the service was good. It was Terri's first time eating there and she also liked it and during our meal she got to meet the husband of her Wynn host who works there in a managerial position. He's quite the cutie and also brought us over a complimentary speciality drink he makes. After dinner Terri drove us to Cosmopolitan for our meet with Kydds, Erin, Mo, Huddler and his friend Brian. The group was already at the Chandelier bar having a great time. That's me with Huddler and Brian, still at the Chandelier bar. I had suggested before all of us got to Vegas that we go to Cosmopolitan's Platinum lounge which is now on the 16th floor since the drinks are good and the prices except for tips free. All of us made the trek up with the exception of Erin who wasn't feeling well and I believe headed back to Aria where she was staying. Sadly the Platinum lounge closes at 10pm so shortly after the above photo was taken we had to leave. In my opinion I think that's a ridiculous hour for a VIP lounge to close and one thing I'll say for the Sands casinos at least their VIP lounges are 24 hours! Kydds, Huddler, Brian and Maureen went off to see the view from Kydds suite. In hindsight, I wish we had joined them as Terri and I at this point decided to go downstairs and gamble for a bit where I promptly lost a few hundred on the $1 DaVinci that I had the $5,000.00 hit on back in March and Terri wasn't exactly winning either. We left Cosmopolitan and back at Mandalay Bay where I went on one of those first night in Vegas gambling frenzy's. Well, my luck had changed after dinner and the above hit on a 5 cent slot was the best I did that evening so I lost my earlier winnings and a thousand of my own money too. Terri did had some luck and got a handpay on 5 cent DaVinci Diamonds which was great! I toddled off to my suite at THEHotel around 4am where I took these photos of THEHotel room service menu and then went to sleep. None of the restaurants at MB appealed to Terri and I (we had forgotten about the Veranda at Four Season's or would have eaten there) when we were ready to eat around 1pm after sleeping in and since we needed to pick up the free tickets to O that came with my M-life offer we decided to eat at Bellagio's cafe. Terri treated us to brunch and this time they were able to use her express comps where back in July their system was temporarily broken and they couldn't. Terri ordered eggs which she said weren't very good, but my chicken cobb salad was tasty. On our way out to pick up the tickets I spied a photo op of the bears that I had missed taking in July. We didn't get to will call for our tickets right away because I spotted the Hangover slots at Bellagio and decided to donate a quick $200.00 to them. 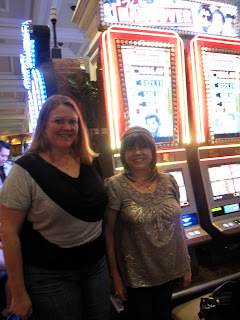 As I was finishing playing Hangover I ran into Kathy (klevegas, blonde4ever Vegas message board) who I had such a good time with in July at the Bellagio Slot tournament. We chatted for a few minutes and made plans to meet up again that evening after O got out. After picking up our tickets for O we left and went back to MB where we had a couple hours to gamble away before dinner and we met up with Bob (imokbob) from the Blonde4ever Vegas message boards. Bob was playing VP and having a drink at the casino bar near my lucky Hexbreaker 2 slot and we spent a fun hour chatting and playing slots like Wolf Run with him. I started to feel tired and ended up going up to my room for the hour before dinner so didn't get to say goodbye to Bob, but we were to see him later that evening after 0. Dinner that evening was at Hubert Keller's tapas restaurant Fleur. The photo above is of the tropical flight of drinks I had there. The green is the Sumo, followed by peach blossom and last the fleurtini. The sumo is bombay dry gin, sake, midori and yuzu. Sparkling peach blossom was absolute peach vodka, creme de peach, peach puree and prosecco. The fleurtini is grey goose vodka, pomegrante, sour apple and prosecco. I loved all 3 and would order this flight again. We ordered a lot of Tapas, too many so we left a lot of food. I had a restaurant.com certificate where you had to spend a $100.00 to get the $50 off, so that's why we did it, that's my story and I'm sticking to it! Above is hummus & baba ganoush with grilled flat bread and in the background a bowl of fried chickpeas. On yelp and TA some of the reviews I've read complain about the small portions at Fleur. I thought for Tapas the portions were large, so unless portion size has been adjusted lately, they were generous and while the hummus and ganoush was great, we couldn't finish it or half the food we ordered. Above is the croque monsieur which is smoked ham, gruyere, with bechamel sauce and a little smoked mustard garnish. This was a favorite of both Terri and myself and you won't be disappointed if you order it. Next up were the chicken croquettes, with the cress hiding the croquettes. It also had pine nuts and garlic creme. This was the least favorite of the Tapas that evening, for me it was because I don't care much for ground chicken, though I did enjoy the cress salad on top of the croquettes. Btw, when one of the servers saw we didn't like it he offered to remove it from our bill. While I didn't take him up on his offer I was impressed he noticed we didn't eat much of it and made the offer. The Italian style meatballs above with minestrone garnish was one of Terri's favorite tapas and I also thought it was very good. The Tarte Flambee of onion, bacon, truffle, aspargus and creme fraiche was delicious, a favorite of both of us. This was the rock shrimp with lots of rice noodles, snow peas, baby corn and red dragon sauce. Terri doesn't like shrimp but she enjoyed a few noodles and I loved everything about this dish, especially the spicy sauce. We shared dessert which was Affogato a la LN2 prepared table side by our main server. This dessert of Bailey's ice cream and very strong expresso was a delight! I have a video of the preparation of this dessert which I thought was fun to watch but I need to go take a lesson at the Apple store and see if there's a way I can lighten the frames up as it's a dim lighted movie. The sumptuous dessert which was split in two for us. They also served the left over expresso from this dessert on the side. As we were finishing our dinner, Terri spied celebrity chef Hurbert Keller in the restaurant going around and talking to various diners and in some cases signing cook books. As it's rare to actually have the celebrity chef of these Vegas restaurants overseeing the kitchen it was exciting for us to see him there and then later meet him. I thought Hurbert Keller was quite charming and easy to talk to and this was one of the highlights of this trip for me. After our lovely dinner, Terri drove us back to the Bellagio where we played slots for a bit before O. I believe Terri was having some luck but I wasn't doing well, though a 2 cent Rembrandt Riches not far from the player's club desk did give me some entertainment for a while. We had great seats for O about 9 rows up I think from the stage, and center seats. This is the 3rd time I've seen it and each time they have made some changes to the story. As always it was enjoyable and Terri liked it too. After O we met up with Bob and Kathy at Bellagio and all the casino bars were busy with waits so we ended up at the Bellagio cafe where Bob bought us a round of drinks. 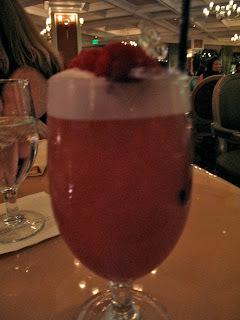 I had a raspberry cocktail that was both pretty and yummy. After a fun chat with Bob and Kathy, Terri and I headed back to Mandalay Bay. At this point I found myself down over $2000.00 and was trying to avoid being a bitter gambler with dubious success. I started to play a new slot called Diamond Vault by IGT that only had a max bet of $1.50 and started to hit a lot of bonuses on it. I think the above at $45.00 was my best bonus due to the fact you have to pick to advance your money in it, but I was getting bonuses frequently enough that even a lousy picker could make some money. After having a lot of fun on this slot, and believing my luck was improving, I decided to try and get some of my losses back. I hit a spin on $5 WOF but it only paid $200, however it added to my gaining some money back, so when I saw a $1 DaVinci slot that I had missed earlier this trip because it was mixed in with quarter slots, I started to play it and was quite happy to start building back the bank roll with some hits of $120.00, and $175.00, before moving on. It's now almost 3am and Terri decides to retire and get some sleep. However remembering that Randy and I have had our largest wins in the past at MB during the 3am to 5am time period and I'm currently on a lucky streak I decide to continue. I go back to the MB high limit room whereI have a reality check and leave the high limit room without playing. As I'm walking away back to the penny slots, I spy outside of the high limit room another $1 DaVinci Diamond machine that I hadn't noticed before. I can't resist, I love those $1 DaVinci's since I hit big in March at Cosmopolitan. I give in and start playing. I get the bonus! It pays $540.00, not bad for a DaVinci bonus so I'm hopeful for more. Shortly after that bonus I get another good hit of $740.00 and decide to take my winnings and go to bed. As I'm walking back to my suite at THEHotel I pass a 5 cent DaVinci across from House of Blues that gave me some wins earlier and I sit down, play and start winning. I'm happily playing at $5 a push, it's 4am, the casino is very empty no one around me, when a young man in his mid or late 20's comes up behind me, then around to my side where I can see him and mistaking me for a cougar tells me he has a room at MB and would I like to join him in it? I'm stunned and instead of just shutting him down I blurt out one of the first things that comes to mind that I'm old enough to be his Mother and his reply is as long as I'm good in bed he doesn't care. At this point I come out of my shock and tell him I'm not interested and that I'm married and surprisingly enough he apologizes and said he didn't notice the ring and walks away. Since he had to be at least a bit drunk, okay more then a bit drunk, maybe on drugs, I was impressed he wasn't slurring his words or stumbling around, but I have to admit that one of the first thoughts that had crossed my mind when he came up to me was photo op, photo op of deluded drunk young man! However I restrained myself as it also occurred to me that might encourage him to suggest something else. Anyway it gave me a fun story, at least fun for me, to tell my friends. After that encounter feeling my lucky streak was over, even though I was now down only about $900 instead of $2000, I decided to go back to the room and get some sleep. A hour or so earlier Terri had texted me that she had been given a late check out of 1pm, so I needed to get one as she was driving me over to check in to Palazzo the next day after check out. On the way to the room I stopped off at the THEHotel registration desk to ask for a 1pm check out and was told I had already requested a 3pm and they had me down for that check out time. This was news to me, but didn't seem worth arguing about, <grin>. The desk clerk also gave me my statement and all the meals that Terri and I had eaten at Mandalay Bay were covered by the $300 F&B comp they had given me upfront in my offer so that worked out well and once again they didn't touch my express comps. This is the end of part one. Part two will cover the last 3 nights of the trip, where Randy arrives and we stay at Palazzo.